What is it like to be on the show Hell's Kitchen? A dozen Reynolds culinary students recently found out. The students joined Clemenza Caserta, a Richmond chef who appeared on this season's show, and Executive Mansion Chef Darren Rounds in a fast-paced, pressure packed cooking competition. Upon arriving in the Executive Mansion’s kitchen, Caserta and Rounds introduced themselves, quickly announced ingredients available and put 30 minutes on the clock for the students to make their best dish. Ingredients included local seasonal items including Virginia Rockfish, tomatoes, eggplant, basil and homemade mozzarella. Upon judging six dishes, Caserta and Rounds proclaimed the winners were Robin Reeks and Stephanie Boehles, who served up pan-sheared Virginia Rockfish with summer-fruit salsa and eggplant parmesan. The winning team was presented with Governor's Mansion china plates signed by Caserta, Rounds and First Lady of Virginia Maureen McDonnell. Additional photos can be found on the College's Facebook site. “We not only want them to stay in school, but to graduate, go to college and get a good job. The key to a good life is a good education.” That’s the message Melanie Rodriguez, Latino Education Advancement Program (LEAP) Director, relays while reflecting on the 60 high school and middle students participating in the LEAP program this summer. LEAP was created in 2007 with funding from the E.E. Ford Foundation to help Hispanic students in the Richmond community pursue postsecondary education. On Monday, June 25, Rodriguez brought the students to the J. Sargeant Reynolds Community College Parham Road Campus so they could tour the campus, meet with advisors and talk to current students. “It is important that the (LEAP) students learn about college and are able to talk to current college students to know how important it is that they stay in school and continue their education,” noted Rodriguez. Kristine Dahm and Carol Krantz from the Office of Student Affairs discussed admissions policies, transfer opportunities, tutoring and academic programs, and the JSRCC student ambassadors conducted a question and answer session. The LEAP students inquired about minimum grade point averages for admittance, where to eat, and how difficult J. Sarge courses are. The students already visited Virginia Commonwealth University, University of Richmond and Randolph-Macon College. JSRCC is the only community college the LEAP students will visit this summer. 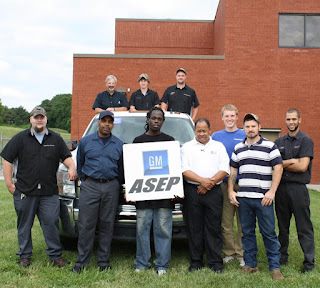 J. Sargeant Reynolds Community College’s GM Automotive Service Excellence Program (ASEP) received a new addition to its training fleet of vehicles, a 2007 Chevrolet Silverado, thanks to the commitment of GM in support of JSRCC’s automotive program. This vehicle is a crew cab dually with the 6.6L turbo diesel engine and Allison transmission. It is equipped with On-Star, cruise control and air conditioning. Automotive service technicians use their high-tech skills to inspect, maintain, and repair automobiles and light trucks that run on gasoline, ethanol and other alternative fuels, such as electricity. Today, integrated electronic systems and complex computers run vehicles and measure their performance while on the road. The increasing sophistication of automotive technology now requires workers who can use computerized shop equipment and work with electronic components while maintaining their skills with traditional hand tools. Technicians must have an increasingly broad base of knowledge about how vehicles’ complex components work and interact, as well as the ability to work with electronic diagnostic equipment and computer-based technical reference materials. 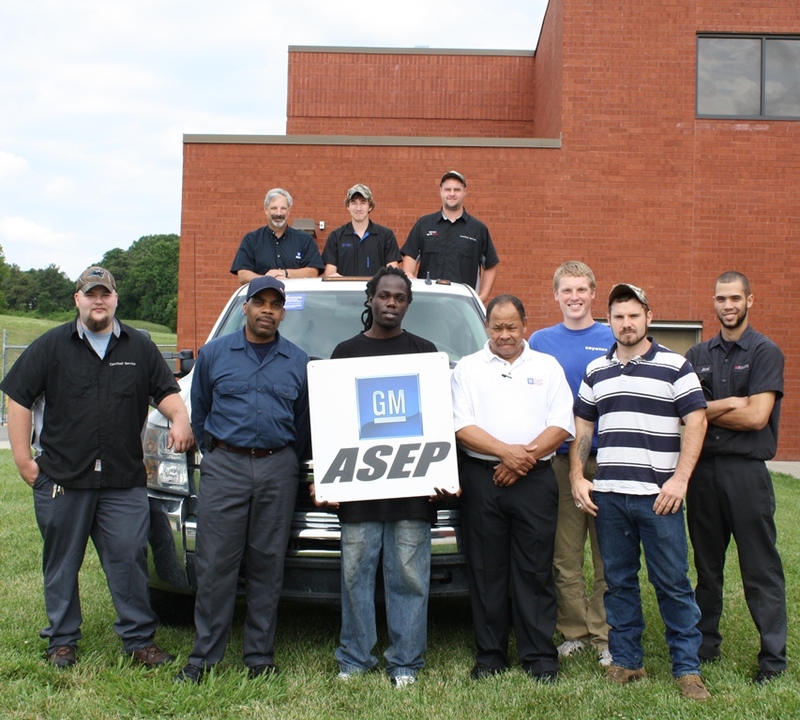 “We are proud to support training programs which prepare the next generation of GM technicians,” Todd Dawn, GM ASEP and AYES Program Manager noted. “Our commitment to our customers goes well beyond building a quality product. That commitment includes quality service after the sale, insuring we fix it right the first time. Our dedication to excellence starts at the training level, and by partnering with schools in communities around the globe, we can feel confident in our ability to provide our customers with an exceptional vehicle ownership experience”. Courses in Automotive Technology are offered at JSRCC’s Goochland Campus, which is located near Routes 6 and 632 in the community of the Goochland Courthouse. Congratulations to two J. Sargeant Reynolds Community College Alumni selected in May 2012 to serve in key roles in their communities! DeWitt Cooper is the new Chief of Police in Tazewell, Virginia. Mr. Cooper received his Associate Degree in Administration of Justice from J. Sargeant Reynolds Community College. He has been in law enforcement for 17 years and previously served as the Chief of Police in Warsaw, Virginia. Jeremy Holloway is the new Chief of Rockingham County Fire and Rescue. Mr. Holloway received his Associate Degree in Fire Science from J. Sargeant Reynolds Community College. He previously served as Rockingham County’s Assistant of Operations. He also worked for the Waynesboro Fire Department and a volunteer in Grottoes. 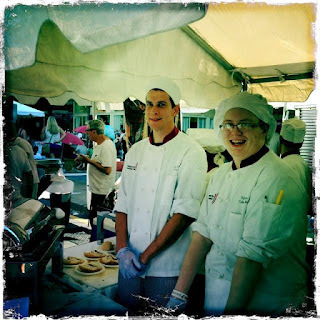 For the 5th year, Broad Appétit served up a delicious afternoon of food, beverage, and entertainment for thousands in downtown Richmond on Sunday, June 3, and for the 5th year J. Sargeant Reynolds Community College was a big part of the day’s event. More than 20 students and instructors from the College’s Culinary Arts Program participated along with chefs from over 70 of Richmond’s finest local restaurants. The students served up nearly 500 plates of coffee-braised beef on a sour pretzel baguette with an arugula salad with homemade hot sauce and a charred corn aioli. 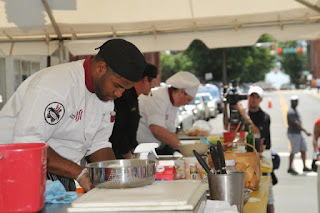 In addition, culinary students Christy Eliasek and Jamell Dickerson served as sous chefs for the entire competition. J. Sargeant Reynolds Community College Culinary Arts Program hosted the Chef’s Demonstration Stage. Chef Jesse Miller, Program Head of the Culinary Arts Program managed the stage, which featured the Throw Down in the Street competition. In this competition, six chefs competed in multiple rounds to win the ultimate cooking showdown! Two chefs in each round were provided a mystery box of ingredients – a protein from a featured local provider, a starch, and a vegetable and given only 45 minutes to create the winning dish. Congratulations to Adjunct Faculty Member Mike Pendergrast who took second place in that competition for this Pork Two-Ways dish! The students who participated reported it was a great opportunity to gain some real-life experience and to interact with the local community. They enjoyed answering questions and sharing information about JSRCC’s Culinary Arts Program with event participants. 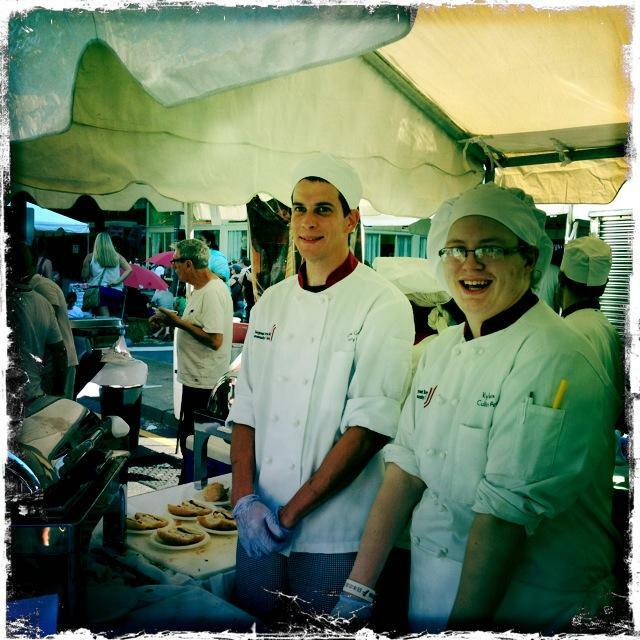 The College’s Culinary Arts program provides a comprehensive occupational-technical education and is intended to lead to employment in a variety of culinary, food service and retail paths. The Culinary Arts Associate of Applied Science degree prepares graduates to enter kitchens as professional cooks in hotels, resorts, restaurants, catering operations and a variety of retail businesses. 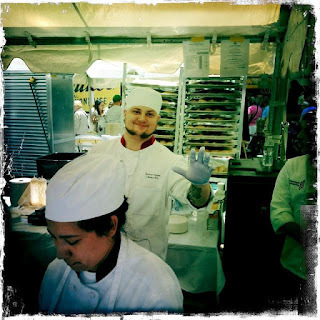 For more information on JSRCC’s Culinary Arts Program, please visit http://www.jsr.vccs.edu/curriculum/programs/Culinary_ArtsAAS.htm.